It’s no wonder that Ann Arbor has such a thriving beer scene today. 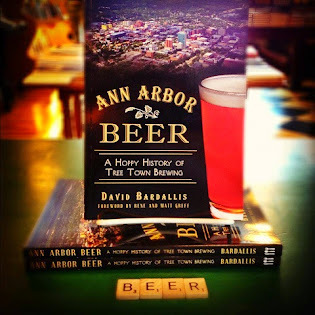 While researching my book, Ann Arbor Beer: A Hoppy History of Tree Town Brewing, I discovered that Tree Town’s beer roots in fact run deep. Ann Arbor was founded in 1824, at a time when the young American republic was awash in booze. Seriously: awash. Historians estimate average consumption nationally at more than a bottle and a half of hard liquor per week for every man, woman, and child. So brewing beer in the 1820s was seemingly secondary to distilling, perhaps also owing to the fact that our frontier forebears did not really understand the role of yeast or the importance of sanitation, nor did they have access to modern conveniences like artificial refrigeration and forced carbonation. In other words, they made ales that were relatively sour, warm, and flat. 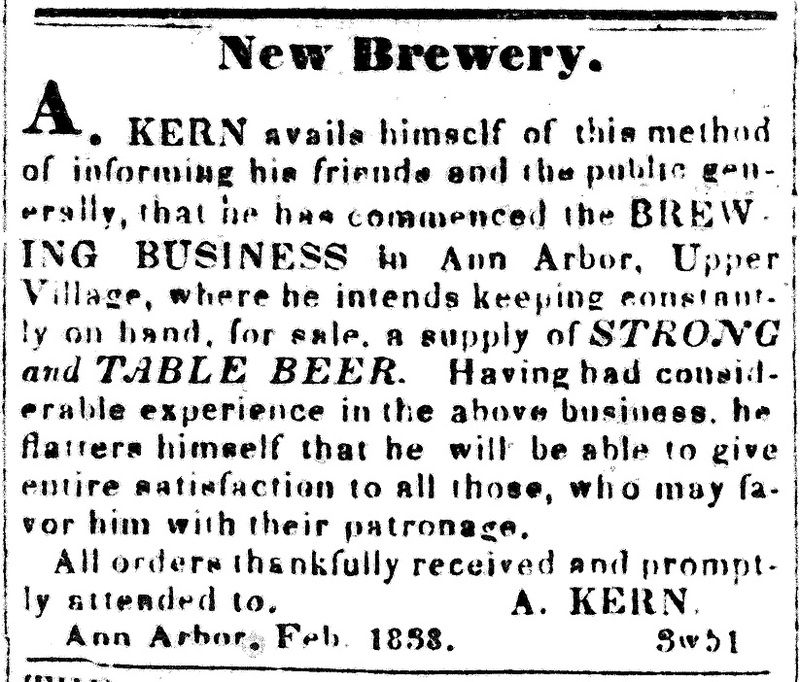 Kern was among other early Ann Arbor commercial brewers with names of English, Irish, and Scotch origin, like Bardwell, Brown, Gordon, Ingalls, and Hooper. Of their breweries, only Richard Hooper’s, located near the site of the present-day Gandy Dancer restaurant, lasted for any significant amount of time, turning out “ale and porter” for a decade before passing to Richard’s sons Frederick and Charles after his death in 1866. 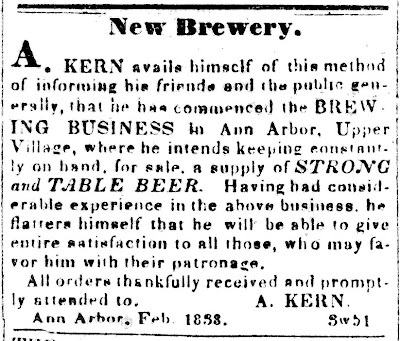 By that time, a new kind of brew was gaining in popularity not just in Ann Arbor but around the country. 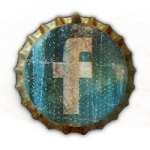 Introduced to America in the 1840s, lager beer was the preferred beverage of the growing population of German immigrants, who had been brewing it for centuries in the Old World. Lager’s cleaner, crisper, and clearer profile also appealed to non-German drinkers, who began spurning the muddy English-style ales in favor of this sparkling new beer. I’ll have more on Ann Arbor’s heavily German heritage and early lager brewers next week, just in time for Oktoberfest. 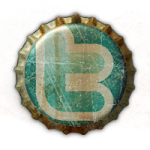 In the meantime, enjoy your Week in Beer. >> At 6:30 p.m., Captain Joe’s Grill, 9901 N. Main, Whitmore Lake, is turning the taps over to five Arbor Brewing libations, including Buzzsaw IPA, Red Snapper Roasted Pale Ale, Hoptown Brown Ale, Strawberry Blonde Ale, and, just released, Violin Monster Autumn Ale. Weather permitting, you can enjoy some or all of these out on the patio. >> Michigan ranks fifth in the entire freaking country in number of breweries and, though I may be a bit biased, No. 1 in the universe in terms of beer awesomeness. Or at least tied with Belgium and maybe a couple other places. Anyway, celebrate Michigan’s many great beers at the Michigan Made Beer Tasting from 7-9 p.m. at Arbor Brewing, 114 E. Washington. There will be more than two dozen from around the state, representing different styles and breweries, along with a hearty appetizer buffet and, as always, the chance to win free beer-related stuff. Tickets are $30; call 734-213-1393 to order. >> Ashley’s, 338 S. State, introduces a new brew from our neighbors to the north: Ephemere Cherry, by Unibroue of Chambly, Quebec, is the latest in the respected brewery’s series of ales made with seasonal fruits. Also on tap: Blanche de Chambly, Ephemere Apple, La Fin du Monde, Maudite, and Trois Pistoles. Quench your thirst for Belgian-style beers from a Japanese-owned French Canadian brewery beginning at 6 p.m.
>> Head over to Whole Foods Cranbrook, 990 W. Eisenhower, and enjoy a happy hour tap takeover with the brewery recently voted best in the Metro Detroit area in MLive’s poll searching for Michigan’s best brewery: Witch’s Hat Brewing of South Lyon. Event runs from 5-7 p.m.; tap list TBD as of this writing. >> Michigan football kicks off at noon, and that means the Wolverine State Brewing taproom, 2019 W. Stadium, is open early, at 10 a.m. to be precise. Drop in for some free breakfast snacks to go with your breakfast beer before you hit the game, or stick around and watch on the tube as Blue gulps down a tasty MAC snack in the form of the Akron Zips. >> OK, so they aren’t getting things going over in Germany until next weekend, but the Corner Brewery, 720 Norris, Ypsilanti, couldn’t wait for Oktoberfest to officially begin. Head to Ypsi’s favorite biergarten beginning at noon for a day of Bavarian-inspired beer, food, and music. Special small-batch brews include Two Rivers Roggenbier, brewed with 50% rye and fermented with hefeweizen yeast; Schwarzbald Schwarzbier, a black beer made with Noble hops; Oh!toberfest, a high-gravity ale fermented with pink peppercorns; Marzen, the classic Oktoberfest style; and Ypsi Lambic, a wild fermented and barrel-aged wheat beer. The polka-ing begins at 6 p.m.; no cover. Sunday, September 15, is the last day to buy $50 advance tickets for the September 26 Art & Brew Pub Crawl to benefit the Ann Arbor Art Center. After that, the price rises to $60. Tickets can be purchased at the Art Center, 117 W. Liberty, or online. Jessica Webster has the story.